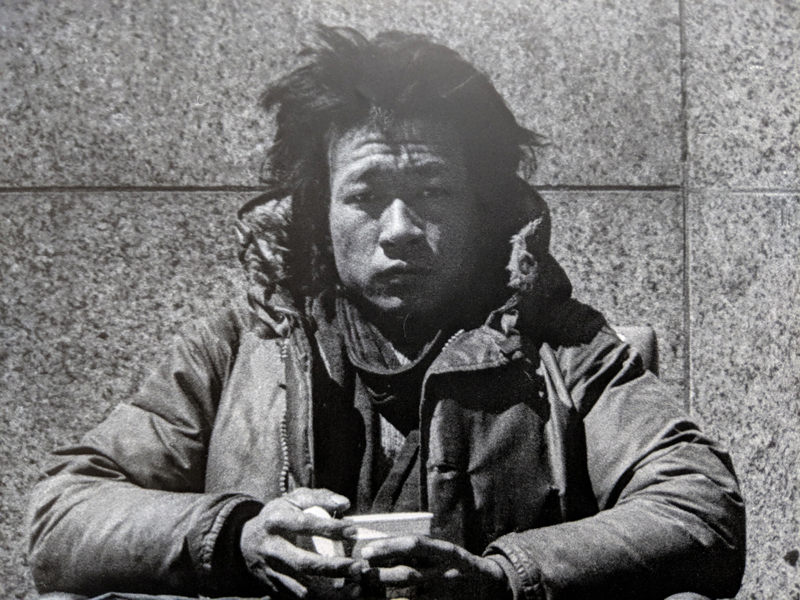 By Masahito Ono: My first encounter to the man, Tehching Hsieh was in July of 2015 in New York. Tehching quietly walked into my MFA studio. He was cleanly dressed and looked aged since he performed his art performances. He looked at my work and pointed out the problems. We discussed time, unit of time and the universality of certain things in our human world. I remember how Tehching and I communicated through writing Chinese characters on my notebook whenever English was not the best way to exchange our thoughts. Tehching stopped making art as he marked his 50th birthday on December 31, 1999 and as we marked the end of the 20th century the same day. One Year Performance 1978-1979 (Cage Piece) is the first of Tehching's six performance pieces. He imprisoned himself inside a cage for one year. Talking, reading, listening or watching was strictly prohibited. There was no other person inside the room to interact with him. In his following One Year Performance 1980-1981 (Time Clock Piece), Tehching punched time on 366 time cards at the top of the hour every hour for one year. The artist had his hair shaved off when he started the performance and had it naturally grow back over the course of one year. At a glance, his artwork may have its face to you as his expression of suffering. In fact, in some of the interviews he had previously given to the others, Teaching had said, "life is a life sentence." In Cage Piece, Tehching's one year was reduced to fulfill only the elemental human needs: to have a shelter (he took this away in his third one year performance between 1981-1982), to dress in a cloth, to breath, to eat and drink water, and to sleep. There was no landscape of the earth nor any human touch or love near him. Was the artist serving a punishment that was imposed to him by no one other than the artist himself, therefore, by his own life? In our conversation, Tehching emphasized his works as not an expression of suffering. Although what he could do for the period was very limited, and there was nearly no space for a change in every cycle (minutes, hours and days) he spent inside the cage, he was consciously and continuously passing the time, waiting for the next hour every hour. The time the man works, the time he sleeps, the time he makes art -- the time he does or does not do anything in his life are all the passing of time. When a colleague of mine, Grace Noh mentioned his missed punches in Clock Piece, the conversation took us further to reveal what I believe is a key element to engage with his work. The missed punches consist of 133 times out of 8,760 times he was supposed to punch for either sleeping, early or late. The missed punches were noted on time cards as they occurred, and the statistic was also prepared on a separate sheet of paper after the performance was completed. When I viewed the 366 time cards all together at the Venice Biennale this year, the missed punches were the central attention of mine as well. The mistakes he had made made the piece more human and in someway refused the work to be viewed as torture. I do not remember exactly, why we started to talk about the Japanese author, Yukio Mishima, who committed a ritual suicide at about the height of his career in 1970. Tehching mentioned this concept of ritual suicide that was tradition among samurai in Japan, to die in honor rather than to live shamefully. In a way, the concept was an athteticized death. If I am not misunderstood, Tehching meant that his idea was nothing similar to this concept. I understood that he meant that his work is not an aesthetization of time or life, he was doing time as it unveiled and he continues to do his time today as it continues to unveil in front of him. The exhibition title, Doing Time at Venice Biennale this year seems to tell his philosophy or suggest his approach to life. Tehching himself and his art does not condemn, celebrate nor aestheticize life. It is an act of passing time. In life, I do my time and you do yours. Tehching had spent his "art time" and his "life time" until 1999. Today, he continues to do his "life time" as an non-artist individual. Every hour, waiting for the next hour. What we feel and understand from his works may not be always accurate to his original intention, but his art povides us with the freedom to interpret the idea of life in our own ways and the idea of "free thinking," that he often talks about. "We lead a difficult life, not always managing to fit our actions to the vision we have of the world. (And when I think I have caught a glimpse of the color of my fate, it flees from my gaze.) We struggle and suffer to reconquer our solitude. But a day comes when the earth has its simple and primitive smile. Then, it is as if the struggles and life within us were rubbed out. Millions of eyes have looked at this landscape, and for me it is like the first smile of the world. It takes me out of myself, in the deepest meaning of the expression. It assures me that nothing matters except my love, and that even this love has no value for me unless it remains innocent and free. It denies me a personality, and deprives my suffering of its echo. The world is beautiful, and this is everything. The great truth which it patiently teaches me is that neither the mind nor even the heart has any importance. And that the stone warmed by the sun or the cypress tree swelling against the empty sky set a boundary to the only world in which "to be right" has any meaning: nature without men. This world reduces me to nothing. It carries me to the very end. Without anger, it denies that I exist. And, agreeing to my defeat, I move toward a wisdom where everything has already been conquered -- except that tears come into my eyes, and this great sob of poetry which swells my heart makes me forget the truth of the world." Tehching's performances started form his simple yet a complicated question to himself, "what am I looking for?" I sometimes think that we are born with a limited number of colors on our palette, each person unique and different. The number may be limited, but the possibility of different colors we can create from the palette is infinite. We know suffering is everywhere. There are pointless and unnecessary evil in this world that are rationalized and justified for the benefit of some parties. Yet, I see we are also capable of finding the beauty that the world and its inhabitants possess. No doubt each one of us contains evil and darkness within ourselves, but we must become capable of excersising more sensitivity and more empathy than those. While I said Tehching is not embracing life, I think the man is embracing its darkness. Therefore, the wholeness and the oneness of life. This what appears to be paradoxical is what I experience from his art and perhaps therefore, from my own life. As one of the many artists whose life was inspired by your thoughts and art, I would like to thank you for this opportunity to meet with MiA Collective Art and also for your understanding and support for our mission and challenge to "exchange thoughts" beyond the boundaries of art forms. It was my concious decision to call you Tehching instead of Heish in this article. I hope you do not mind. You might have stopped making art at the end of the last century, but I feel that you have not fully become an non-artist individual yet. You live in the extension of the artist that you once were. You are still living the life of yours as all of us do with our own. I am grateful to have had the time to do the time with you.